Like most eco-warriors I had the standard comprehensive list in my heart of eco-bling I wanted at The Secret Acre – PV, solar thermal, rainwater harvesting, green roof, etc. But having worked at Forum for the Future on pathfinder retrofit projects, I knew in my head that our first priority on a budget had to be insulation, insulation, insulation. So making it warm and properly insulated for the next 100 years has to come first, and then worry about the bling. And as with every retrofit, you have to work with the existing building you have to do what is possible, practical and appropriate. For The Secret Acre’s 1930s bungalow the insulation choices were fairly easy. The new build sections (roof dormer and timber frame extension with a green roof) would have to be insulated to modern building regulation regardless. It’s all about insulation, insulation, insulation – and the new roof allowed the original 1930s horse hair insulation to be replaced! The need for a new roof allowed full roof insulation to be added too, replacing the original 1930s horse hair still in situ! New windows throughout with as low a u-value (typically 1.2 to 1.8) as we could afford. Then underfloor insulation retrofitted throughout, along with external solid wall insulation all the way round. 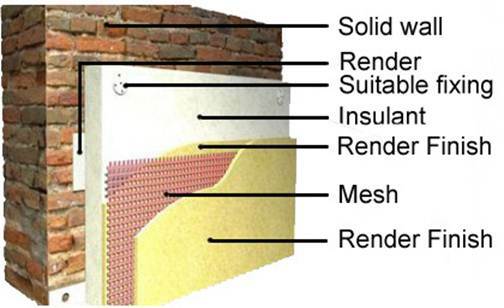 This is how external solid wall insulation works – like wrapping your home in a warm duvet. 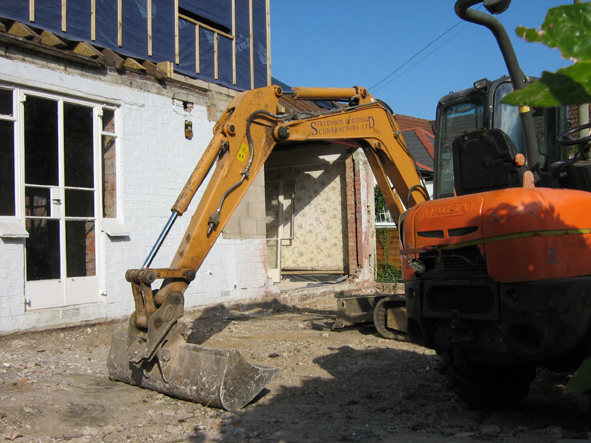 Most of the properties Emma and I looked at before finding The Secret Acre where of solid wall construction and would have required the retrofit of external insulation to make them warm and fit for the future. So I was delighted to see stretcher bond brick work at The Secret Acre indicating a cavity wall. Oh good, I thought, just a cheap or free cavity wall injection of insulation. But on investigation, our 1930s property is an early cavity, a bit smaller than modern standards, which along with the wall ties makes it tricky to get a really good injection without gaps and cold spots. So we have ended up opting for external wall insulation after all, despite having the cavity, but this gives us a better level of insulation and the thermal mass of the bricks working for us on the inside. As for the eco-bling, we have had to compromise in two areas, one for practical reasons and one for budgetary reasons. We can’t afford this full system, but we’ll still capture the rainwater from our roof to water the veg beds to avoid water meter bills. Naturally we discovered we couldn’t afford everything on our wish list. Something would have to give. In the end it was the commercial rainwater harvesting system. This we decided to drop after an unconnected visit to Sundeala, a local firm making recycled pin boards, to salvage some wooden planks for the garden. The site manager casually asked if we also wanted any 1,000 litre tanks. All the local allotment holders already had them, so we can’t give them away anymore he informed us. Yes please we said in our best Tom and Barbara voices. So gone, but not forgotten. We now plan to add DIY water harvesting to our roof downpipes once we have moved in, courtesy of the free water tanks. The subject of a future post here no doubt. 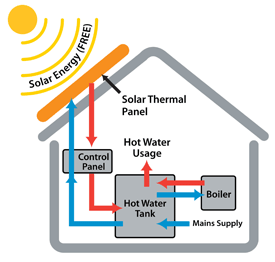 This is how solar thermal works – giving you lots of hot water for free. The energy generation measures posed a more practical problem. The Secret Acre’s southerly facing rear aspect was a text book example of the perfect smallholder’s property with a roof full of PV. But we were putting a dormer in that roof, realistically only leaving enough space for a couple of solar thermal panels for hot water. So that’s what we opted for. 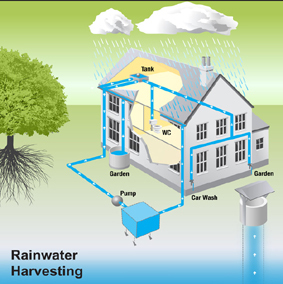 But like the rainwater harvesting, a domestic 4kw PV system to generate electricity has not been forgotten. If we can’t put it on the roof anymore, we’ll ground mount it instead. 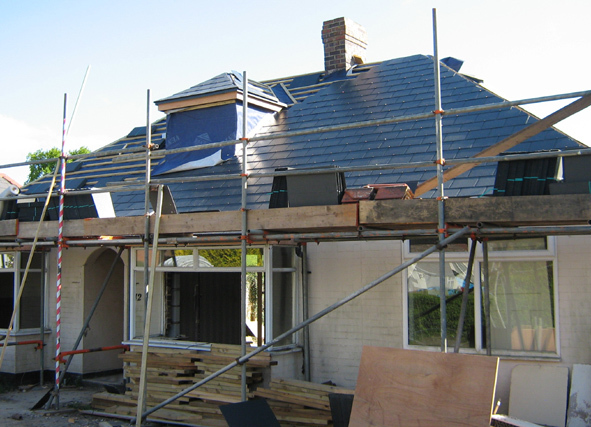 But even through it is a standard domestic 4kw roof system, as soon as it is not actually on your roof, then we need planning permission for it. So that’s another job to tackle once we’ve moved in. Watch this space! This entry was posted in House and tagged Forum for the Future, green roof, insulation, Paul Rainger, PV, rainwater harvesting, retrofit, self-sufficiency, solar thermal, solid wall insulation by paulrainger. Bookmark the permalink. Smallholder trying to be selfsufficientish. Previously an environmental campaigner, and Founder of Bristol's BIG Green Week Festival. Me, I'm just a lawnmower, you can tell me from the way I walk. Enjoyed the techie learning on self-sufficiency, very insightful.